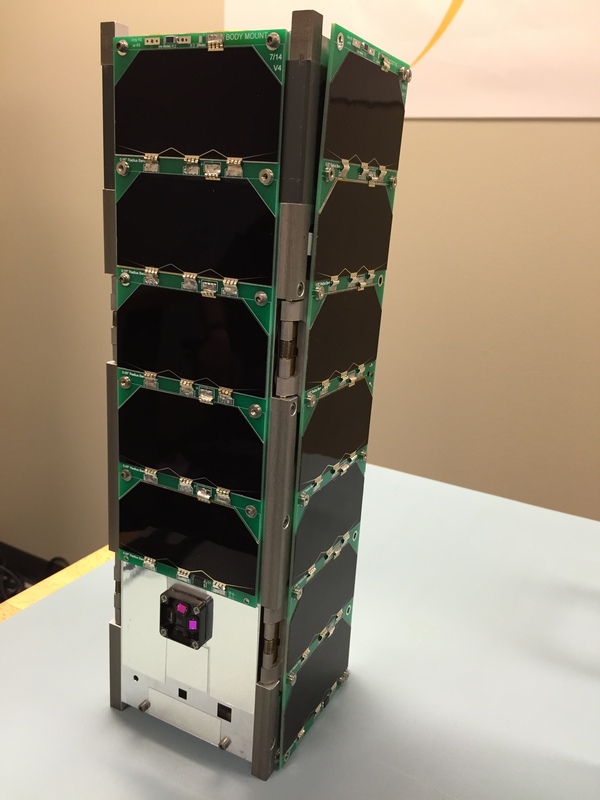 September 19, 2015 -The University of Colorado’s Laboratory for Atmospheric and Space Physics (LASP) recently completed delivery of MinXSS, a four-year NASA-funded CubeSat that will be analyzing the soft X-ray spectrum of the sun. The Miniature X-Ray Solar Spectrometer (MinXSS) is a 3U CubeSat designed and developed as part of the Aerospace Engineering Sciences (AES) graduate projects course at the University of Colorado Boulder (CU) with support from LASP. All standard satellite subsystems are present in MinXSS, except propulsion, and the entire unit is roughly the size of a loaf of bread. 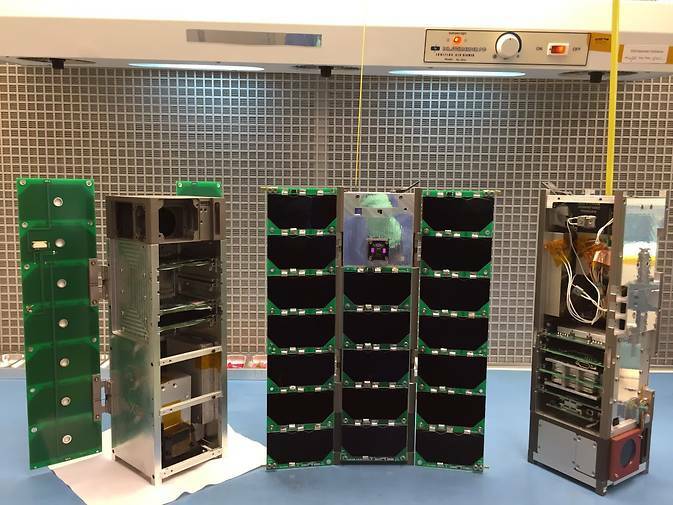 Many of the subsystems were custom-developed by CU and LASP, leveraging heritage from the highly successful Colorado Student Space Weather Experiment (CSSWE) CubeSat, which was a result of the same AES/LASP collaboration. The AES graduate projects course averages 11 students per semester and involves them in design, building and testing of the CubeSat. Over 40 students and 40 professionals have been involved in the MinXSS project. The primary science objective of MinXSS is to fill a critical spectral gap in solar measurements currently made by large satellite missions – and MinXSS will do this for a fraction of the cost. At any given moment, the sun emits a range of light waves far more expansive than what our eyes can see: from visible light to extreme ultraviolet to soft and hard X-rays. When observed and analyzed, those wavelengths can provide scientists with valuable information about the sun’s activity and also its effects on Earth. The key to predicting the occurrence of solar weather, and ideally mitigating its harm, is in understanding the entire solar spectrum. MinXSS will play a critical role in this by collecting data on the sun’s soft X-ray emissions, a region of the spectrum that is relatively unstudied, but which Mason describes as “potentially very scientifically rich.” Data from MinXSS will be used to refine the forecasts made by NOAA’s Space Weather Prediction Center in Boulder, Colorado, and the satellite drag models produced by the U.S. Air Force. Braxton Technologies has been working with the mission team to build a copy of the ground station that’s located in Boulder. The new station will be located in Colorado Springs, and although not directly contributing to this project, it will be used for later CubeSat projects. MinXSS flight model 1 (FM-1) is scheduled to launch on the ORB-4 United Launch Alliance Atlas V/Cygnus mission to the International Space Station (ISS) on November 19, 2015. It will be deployed from a NanoRacks CubeSat Deployer on the ISS, where it will have an expected 5-12 month orbital lifetime, dependent on atmospheric conditions. The date of deployment has not been decided yet. Mason is currently a LASP Graduate Research Assistant and will be defending his thesis next May. CU Professor Tom Woods is the MinXSS principal investigator. Dr. Scott Palo and Dr. Xinlin Li serve as CU AES faculty advisors. The AES department supported the first year of the MinXSS project and this was augmented with support from the National Science Foundation (NSF) in the second year, which enabled the design and manufacture of the first flight prototype. With subsequent funding by NASA’s Heliophysics Division in 2014-2016, two flight models have been built. NASA funding also supports environmental testing, mission operations, data analysis and public data distribution. CubeSats are built to standard specifications of 1 unit (U), which is equal to 10x10x10 centimeters (about 4x4x4 inches). CubeSats can be 1U, 2U, 3U or 6U in size, weighing about 3 pounds per U. They often are launched into orbit as auxiliary payloads aboard rockets, significantly reducing costs. In the future, 12U and 27U CubeSat standards will open up even more science capabilities by allowing for larger and more sophisticated instruments. Standardized buses that can be commercially procured are becoming readily available.